I know I have been terribly late with this blog update. I know I haven’t filled this space in the longest time (The blog archive speaks for itself). I know I have had this writer’s block. Again. It has been very disappointing for me, too…not writing and all. 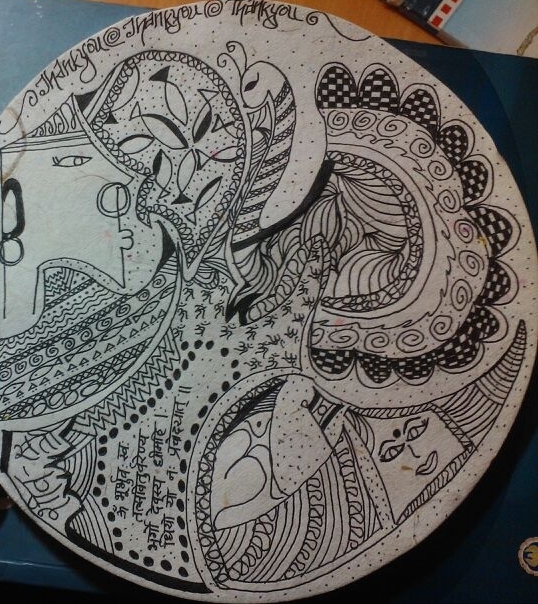 So while I was combating the writer’s block, there was another form of creativity that I (re)ventured into – Art. Having not touched a paint-brush or crayons or paints for almost six years now, taking to art was a welcome change! I could feel the creativity inside me and even after all this while and it just made me so happy to get back to doing something that I always loved back in my school days! I ain’t no photographer (which means the photos are unedited and badly clicked), but here are a few photos of what I managed to do during the last few days! Dekko Dekko! 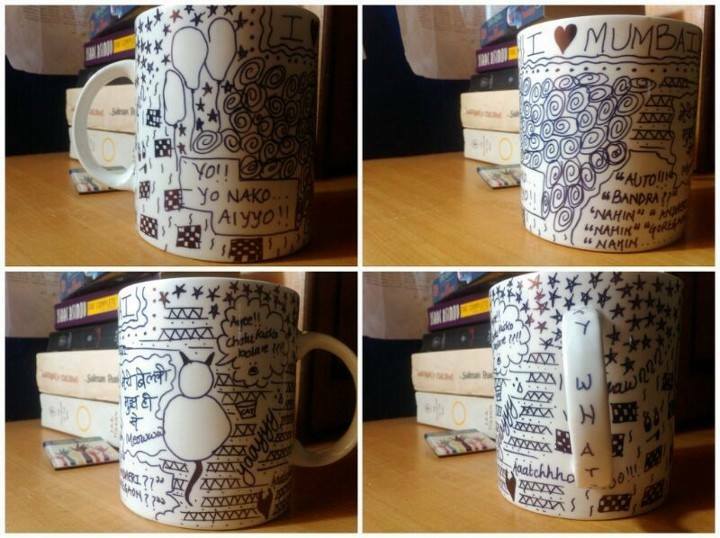 A mug and a marker is all you need! 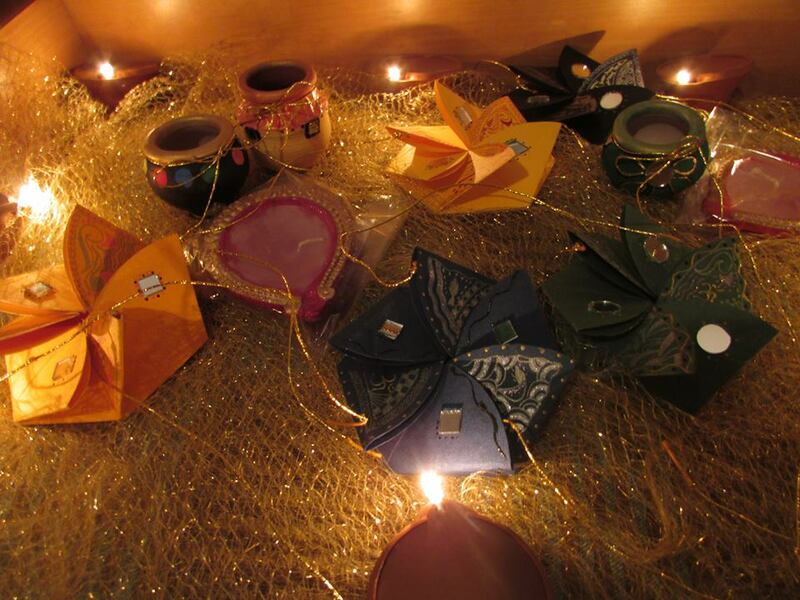 And finally…diwali cards and goodies! So maybe you should try getting back to doing something that you really loved, once upon a time? A few years back, or maybe when you were a kid? Cooking, sewing, playing a sport that you no longer play, photography, feeding stray animals…just about anything! So I’m back to the blogger world..finally! After a month of hardwork, studying and writer’s block, I am back! Its quite surprising how new ideas for blog posts and write ups randomly trickle into my head at the weirdest time (Read: a couple of hours before an exam) and how this writer’s block manages to vanish oh-so-suddenly and just when I’m least expecting it to! So just to update the ten of you (who’re even bothering to read on a lazy Sunday evening) on the random happenings in my life, the meter box in my building caught fire today morning! It was kinda shocking as I was suddenly awoken from a deep slumber by mom and asked to rush out of the house straight away! Whoa ..so much for excitement in life! The half an hour that followed, was filled with calls for help, calling the fire brigade (which eventually didn’t turn up) and pouring buckets of mud on the burning meter box! Luckily for us, the fire was not all that big and even though the slightest delay on our end would’ve caused it to spread, help came in no time from neighbours residing in the adjoining buildings. The problem has been solved for now, but it really made me ponder on the magnitude of the situation and what would have happened had we not been vigilant and quick in action. This could have happened to any of us..in any other building..at any other place..but are we, as residents of our society and citizens of Mumbai, aware of what ought to be done in situations like this? Do we know how to use the fire extinguisher or how to douse a fire? Are we aware that the slightest delay in decision making can cause such tremendous loss? I think there is an urgent need for all societies, big or small, to conduct fire drills and awareness programs in order to educate citizens on how to react to such calamities. Education is the best solution to this problem. Maybe, I would’ve never given a thought to these things had my building not caught fire today. But now that I have gone through it (and by God’s grace there was no damage done), I cannot stress enough on the need for people to be alert and behave rightly in such circumstances. On the positive side, other than the fact that we’re alive and the fire wasn’t a big one and there was no damage done (excluding the massive bill that we have to pay to the electrician), the power-less period proved to be quite helpful, too! 3) Started reading ‘Chanakya’s Chant’ by Ashwin Sanghi..again something that I kept pushing to a later date..thanks to a hectic work schedule and EXAMS. Overall, the day was a right balance of how I’d usually want Sundays to be (Of course, excluding the fire AND the no-movies)! keep smiling and time-passing..also, wish me luck for my Computer Practicals!! PS: I watched Kahaani yesterday! Fab movie!! Go watch it. Quick! Before i reveal the suspense and ruin the movie for you! !